All these photos in this gallery were taken by T.A. Grut. Examples of his work are shown below the editorial. A small exhibition of Thomas and Norman Grut's work took place in Guernsey in March/April 2013 at 'the greenhouse' which is the Guernsey Arts Commission's dedicated space committed to the nurture, cultivation and exhibition of ideas and projects. 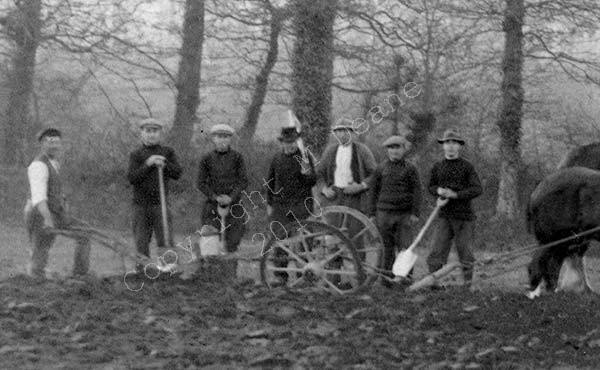 The images on display range from the late 1800’s through to the 1950’s and include the work of Thomas Alfred Grut, founder of T A Grut’s Photographic Studio, his son Norman Grut and my Grandfather Alan Grut (who started as a commercial photographer for Grut’s) along with other Grut’s photographers. Here’s how my great great grandfather is described in the book ‘Peter Girard's Guernsey: A miscellany of Guernsey's history, and its people,’1 . ‘A Town character, Mr Thomas Grut, whose talents included delighting many with fictitious accounts of various local happenings, could have been described as a true-life Ebenezer Le Page, whose dry sense of humour found universal appreciation. ‘His profession was as a photographer but his heart seemed to lie in writing. Thomas Alfred Grut was the author of Des Lures Guernesiaises (Guernsey Stories) and of contributions to the Gazette de Guernsey and to the Star. ‘Mr Thomas Grut was born in St.Peter Port in 1852… being a member of a very old Guernsey family it was not unusual to find that men like him could speak Norman–French (Guernsey Patois) – indeed it was very profitable and useful for a businessman to be able to talk to many of this customers in their own language. ‘In addition to this it appears that Mr Grut would walk through the town on market days chatting to acquaintances and enjoying the opportunity of relating jokes and tales.’ Apparently he specialised in portraits but the work involved cannot be compared with that in use today. Before taking the photograph Mr Grut had to enter his darkroom to coat the plates with the necessary chemicals and then he had to clamp the sitter into a chair because the slightest movement could ruin the action of the slow acting emulsion. His photographs were taken in the daylight in a studio built somewhat like a greenhouse and fitted with blinds which could cut out light which was not required. Finally a white sheet was used as a reflector. He was a family man, having married Elizabeth Cohu who brought seven children into the world –four boys and three girls (two boys died at an early age). After finding such a great character reference and information on my Great Great Grandfather I wondered what his son Norman was like. I asked people who had worked for Norman Grut, my great grandfather, about his character - many said he came across as severe but was actually very friendly. Canadian relatives remember him as great fun when he visited them in Canada and he was known as an adventurer - he travelled to South America by boat, a risky journey and big adventure in those days. Most of you will have always known Grut’s as the photographers or Grut’s the Shop in Le Pollet, St Peter Port. The premises were acquired by Thomas Alfred when he moved his business from a studio in Victoria Road. I have visited Hautville House and spoken to their Scholars who have informed me that Thomas Alfred Grut photographed members of Victor Hugo’s family. Thomas Grut photographed Jeanne Hugo (1869-1941) and her son Charles Daudet (1892-1960). Jeanne Hugo was Victor Hugo's granddaughter, daughter of Charles Hugo (Victor Hugo's 2nd son) and Alice Hugo née Lehaene; Married to Léon Daudet (French politician), Jean Charcot (polar scientist) and Michel Négreponte (Greek Officer). The three families—Hugo, Daudet, Charcot—represented the best of what France had to offer: integrity, success, Republican fortitude, and even genius. Victor Hugo adored Jeanne Hugo and her brother Georges and he published a testimony of love L'art d'être grandpère (1877) which contains poems full of humour and tenderness that reflect Hugo's delight in his grandchildren Georges and Jeanne.Il publie en janvier 1862 des morceaux choisis : Les Enfants ; le 12 mai 1877 paraît L'Art d'être grand-père : ce recueil lyrique dépasse le cadre familial, car l'homme et l'écrivain Hugo y parle aussi de ses activités sociales et politiques. Thomas Alfred Grut also photographed Julie Chenay née Foucher (1822-1905), Victor Hugo's sister-in-law, sister of Adèle Hugo (Victor Hugo's wife). She was only two years older than Victor Hugo's first daughter who dramatically died in 1843. Therefore Victor Hugo and his wife Adèle considered her almost as a daughter. She was educated in "La Maison de la Légion d'honneur" School, where she became a teacher for a number of years. In 1858, she married Paul Chenay (1818-1906), an engraver who actually made reproductions of Victor Hugo's drawings. The marriage did not go well and Julie Chenay came to Guernsey in 1860 to Hauteville House while Victor Hugo was in exile. She became the caretaker of the house in 1861. She was a good help for Victor Hugo when he asked her to be a copyists on the novel "Les Misérables". She stayed very close to Victor Hugo until he died in 1885. She was really part of the family. The photographs Thomas took are held at the Victor Hugo Museum in Paris. We believe that Thomas Grut was apprentice to French photographer M. Andre who was listed in Carel Toms’ list of Guernsey photographers compiled between 1843 and 1910. Among the names of 70 photographers Andre is listed as living in 2 Victoria Crescent, Victoria Road in 1878. This is also the year that Andre photographed Victor Hugo. The other thing to note is that Victor Hugo brought over many prestigious photographers of the day to photograph him and his family and to teach his son photography. Hugo had his own dark room installed in Hauteville House and was very keen for his son to become a photographer. Later Thomas’s calling cards dropped ‘Photographie Parisienne’ and any mention of Andre. They stated: T.A. Grut 2 Victoria Crescent Guernsey. The calling cards are interesting to look at. While the photos are all different for each photographer the thing that really differentiates them is on the reverse. Each calling card I have seen has drawn me to the back, although the photographs themselves are beautiful, the backs of the cards are intricate works of art in themselves with beautiful typography, so much attention to detail and so graphically pleasing. I also love the logos Thomas has designed for himself. When he moves to the Central Studio 5 the Pollet, the calling cards appear more decorative on the front and have a coat of arms at the bottom of each image. I know from my family tree that the Grut family have a Coat of Arms but Thomas Grut’s arms seem an elaborate take on the rather more basic coat of arms that is presented on the tree. At the bottom of Thomas’s calling cards the coat of arms reads ‘’UN DIEU UN ROI (or ROY)’’ which we think translates as ‘’A GOD A KING’ This is rather different from the family tree Coat of Arms which reads ‘Dominis praesidium meum’ which translates ‘‘THE LORD IS MY DEFENCE’. The ancient family from Holland were awarded the arms in return for providing shelter to a royal personage and so it is reasonable to assume the arms are registered in Holland. Obviously Thomas’s elaborate take on the arms were used to produce an attractive trade symbol. It is also interesting to point out that 5 The Pollet has been a photographic studio since 1858 when a Mr Warner from Regent Street, London took over the premises. From then on until Thomas took over a further four photographers that we know of were residing there. In fact, since 1858 till today 5 The Pollet has either been used as a portrait studio or as a store selling photographic equipment, Jessops being the last tenant of number 5. I wonder what the premises will be used for in the future? Thanks to Mike Deane and the Scholars at Hauteville House for the all the information and research they have contributed to this text.